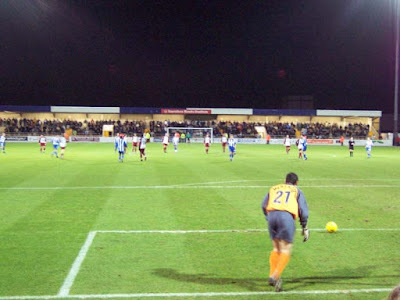 After the aborted trip to the Deva Stadium (or the Saunders-Honda Stadium as it is known to the PA announcer and marketing department) in January, this was a case of putting matters straight. Chester is a nice easy trip from Liverpool and is a quite beautiful city, like Chichester, York and Durham. Tonights fixture pits two teams, then, with recent Conference experience. 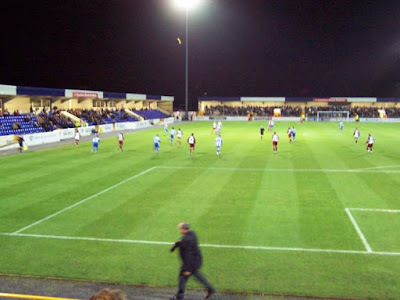 Cheltenham were traditionally a non-league side and their ground still conveys this which shows just how great Steve Cotterill's achievement was to take them from the Southern League to League One (Division Two in the old money) in the space of 5 years. Now Cotterill has gone and Cheltenham are back in League Two, but have fairly consolidated their position as a League side. 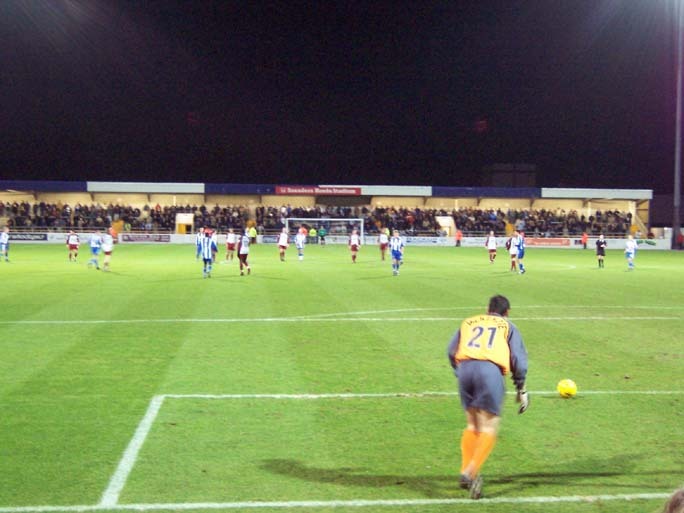 Although with 3-up, 3-down mooted between League Two and Conference, they could well dip back into the murky non-league waters from time to time. Chester despite a long league tradition fell out of the league a few seasons back but came back at the end of last year, a steady ship with Mark Wright at the helm. Wright, though, quit on the cusp of this campaign, the rumour being that he was doing the beast with two backs with one of his player's wives. Lost the dressing room, but won the bedroom, y'might say, but I wouldn't be so ungracious. Now though Wright's former Liverpool team-mate Ian 'Ravishing Rick Rude' Rush is in charge in his first managerial job. He seemed to disappear for a few years after his playing retirement, but now he's back and was even touted for the Welsh job after about 5 games in charge at the Deva. Ian Rush, aside from the goals and the pepperami-esque physique, was also legendary for his triumphantly Scouse tache. Indeed, despite now being clean shaven and flecked with grey hair, I may well start a feature 'Great Sporting 'Taches Of Our Time' based on many a facial-hair related conversation with my chum, 'Chas' McDevitt. Look out for that, readers. The game was pretty good, with 2 keeper errors summing up the game. 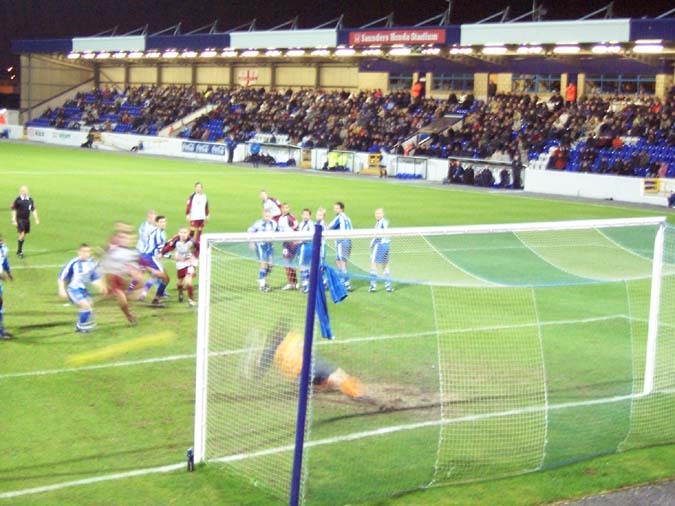 Cheltenham's keeper made a howler of a clearance only for the lob to be just a touch too weak, allowing him to race back and just palm it away before it crossed the line. When Chester were forced into a similar error, a lack of communication meaning a Chester defender Phil Bolland was not aware that keeper Chris Mackenzie had come out to the edge of his area to collect and thus booted is back pass straight into the keeper's foot, Cheltenham almost failed to capitalise. However, while the lob initially hit the post but the alert Steven Gillespie was on hand to tap in a second killer goal for the Robins. The luck was with the Gloucestershire side. Apparently Gillespie also scored a penalty in the final minute but I had had to scoot for the train, and also missed a second yellow for Chester's David Bayliss. Rush described it as their worst performance of the season, and it was watched by the lowest crowd of the season, about a thousand below their average. On top of this Chester now hover over the relegation mixer, they should be okay as I fancy Cambridge and Kidderminster will succumb, but their forthcoming trip to Kiddie will indeed be vital.